Orchids pop up in so many designs, from wallpaper to food art, that it was a treat to find that one particular specimen appearing on a new coin. The National Bank of Ukraine has issued the latest coin in its continuing series, “Flora and Fauna of Ukraine” in an inspired project honouring endangered species of plants found in and around the country. 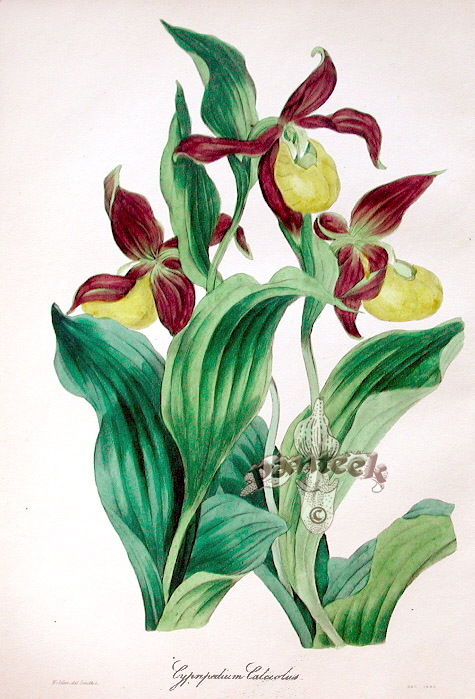 The latest issue features the orchid affectionately referred to as Lady’s Slipper, or Cypripedium Calceolus. Regarded as one of the most famous orchids of the northern hemisphere, the elegant lady’s slipper orchid is said to be named after the footwear of Eastern European footwear. The slipper-shaped lip traps insects as they are forced to climb up past the staminode, a stem modified to produce nectar. Experts will also know that, unlike most other orchids, these blooms have two fertile anthers which classifies them as “diandrous”, causing botanists to question whether this clade or group of organisms should be classified within the orchid family, Orchidaceae, or if they should be designated as a separate family altogether, referred to as Cypripediaceae. Other things you might not know? It has declined over much of the European part of its range, and as a result is legally protected in a number of countries. The Norwegian municipality of Snåsa has a Cypripedium calceolus in its coat-of-arms. And finally, in Pavel Ivanovich Melnikov's “In the Forests”, a znakharka (Russian wise woman) calls this Adam’s head, Adam’s grass, and even Cuckoo’s slippers and says the flower is good for every ill including driving away evil spirits. But back to the coins (ten and two Hryvnia worth 30p and 6p respectively), produced by the Mint of Ukraine, are designed by Volodymyr Demianenko. 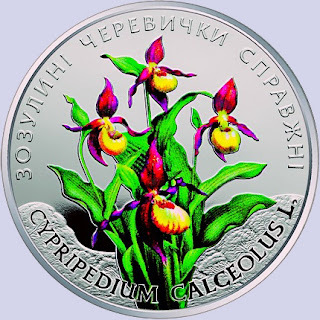 What makes the two-hryvnia coins particularly stunning is that the obverse of the nickel silver pieces includes a faithfully replicated colour depiction of the lady slipper orchid, with the semi-circular inscription, зозулині черевички справжні, above the primary design, and CYPRIPEDIUM CALCEOLUS L below. The reverse side includes the Ukrainian crest positioned toward the top with a garland of flowers, and a songbird that surrounds the coin’s denomination. I am not a numismatologist, but I would find it hard not to keep one of these. I hope it wouldn't be insulting to suggest that it would make delightful charms for a bracelet, necklace or key fob, for example?